How To: Make One-of-a-Kind Prints Using Gelatin! I took a bunch of different printmaking classes in college, but this technique still blows my mind! No fancy presses, machines, or chemicals required -- just regular old gelatin. Amazing, right? I thought these DIY paper pencils would fit in quite nicely with the "art" theme we're rocking this month. The possibilities are as endless and pretty and artsy as you want them to be! New spring blossoms aren't just for the outside! 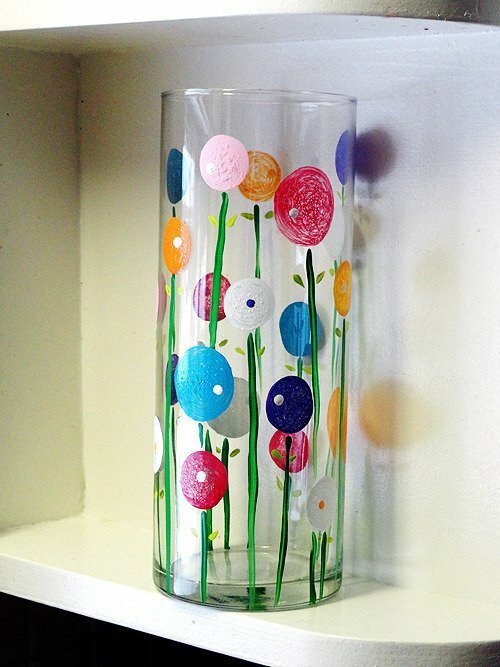 How about sprucing up those plain glass vases with paint? And unlike the flowers starting to blossom outside, these colorful poppies are there to stay. I have bats. Not in my house, thank goodness, but in my yard. We see them flying in their ungainly way amongst the treetops at twilight. They are always welcome, but at this time of year, when the wee beasties become a bit more scarce and hibernation is around the corner, the bats make fewer visits. Good thing there is bat crafts to fill the void. The 4th of July is just days away, but we still have time to get our patriotic craft on. I scoured the internets for some Curbly-worthy projects and narrowed it down to these five. The wreath pictured above, is the most ambitious of all the projects featured here, but it does have impact. See how to make it at All You. Via. These festive straw decorations and matchbook labels are templates, which you can download for free at Twig & Thistle. 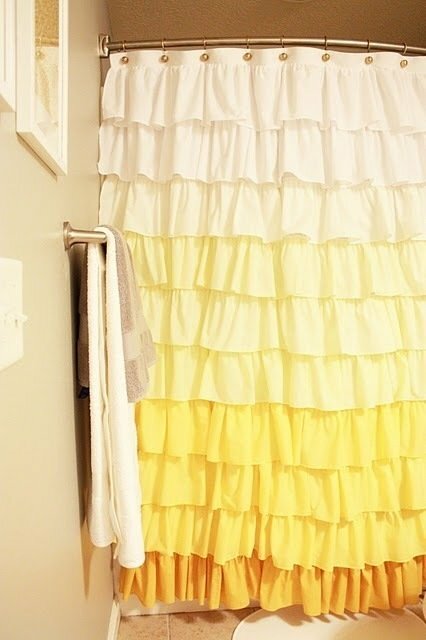 A DIY Shower Curtain for Ruffle Lovers... Or Anyone! Shower Curtains are all-important when it comes to bathrooms. I have to admit, I've been through 7 shower curtains in 5 years (and I have another one still in its packaging, waiting for its debut), and my husband thinks I'm crazy. The problem is, I get antsy for new design quickly, and a new curtain is usually the easiest way to give the room a pick-me-up. What happens if you fall in love with a curtain design that is out of your price range? You DIY it, of course! Valentine's Day may be only 4 days away, but you still have plenty of time to make something special for your favorite people. Here's some quick and easy projects that you can whip up in no time! Pictured above: These patterned fortune cookie freebees from Celeste are a MUST download. Hearts! Hearts everywhere! With so many fabulous tutorials out there, it's hard to choose only one. Of course, with these clever & easy how-tos, you can do them all with time to spare. Pictured above is felt heart garland from How About Orange. You know that aisle at Goodwill that has all the cruddy wood knick-knacks made out of pine with that yellow orangey stain? It's the one that has lots of wood pieces with heart shaped cut outs. Change of policy: Don't walk by it, stop and hunt for a display shelf. You will not believe what a little TLC did for this dog. Twinkling icicles are lovely and romantic, but like romance, they can also be downright dangerous! First, they can be a sign that something is very wrong in your attic (like not enough insulation or ventilation) and second, they can poke your eye out, kid. My snowsicle, on the other hand, provides all the twinkling romance of the real thing without the menace. So why not make one for your boo this holiday season?